Precision engineering, optical excellence, and rock-solid reliability all converge in the finest family of tactical riflescopes in the world today. Created with feedback from law enforcement and military experts nationwide, Bushnell products provide optical precision and blacked-out cosmetics for the most demanding tactical shooting situations you can face. Bushnell products include binoculars, scopes, GPS technology, and hunting and shooting gear and accessories. Whether you are hunting or tactical shooting, find your target with the Bushnell Scout 1000 ARC laser rangefinder. Enjoy the advantage of precise distance information on your next hunt with the Bushnell Scout DX 1000 ARC rangefinder. It features a built-in inclinometer and ARC mode for both bows and rifles, providing exact distance in yards to your target, plus bullet-drop and holdover data in rifle mode. Effective up to a range of 1,000 yards, the rangefinder has an accuracy of half a yard. The ARC rangefinder also features a VSI (Variable Sight-in) with 3 modes, including Bullseye, Brush, and Scan mode. Get closer to the action with the provided magnification capabilities of 6x 21mm from the 1000 ARC rangefinder. Amazingly compact and simple to use, the Scout 1000 ARC figures distance based on terrain angle to give you an accurate “shoots-like” distance to 1,000 yards. Rifle Mode even tells you where to hold for optimum output. The featured Rifle Mode provides bullet-drop/holdover in inches, MOA & Mil on the display. 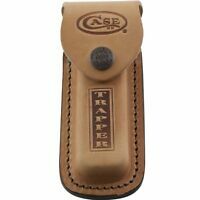 With selectable Bow and Rifle Modes, it has the same capability some existing rangefinders need to split into two separate units, all with the tap of a button. The Bushnell Scout 1000 ARC rangefinder is a vertical unit small enough to fit in your shirt pocket. The Bushnell Scout 1000 ARC laser rangefinder provides unmatched ballistic capability. Designed for use regardless of the conditions, this rangefinder offers extreme up-and-downhill angles after true horizontal distance to your target. ARC accounts for the terrain when calculating distance, so you know precisely how to shoot the range. Hunters can appreciate the durability of the Scout 1000, as well as its water and fog proofing. In addition, the 1000 ARC comes in a choice of black or RealTree finishes, allowing your equipment to join you and your camo in blending into the background. The Bushnell ARC 1000 is features a pocket-size ergonomic design with textured rubber grip. 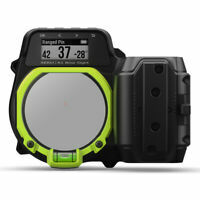 This compact but precise rangefinder is lightweight and is powered by a 3-Volt CR2 battery. Additional accessories include an easy to search user guide manual for troubleshooting and a description of all the features. In addition, accessories such as the carrying case and neck strap keep the unit free from scratches and protected even on the go and straight out of the box. Bushnell has been the industry leader in high-performance sports optics and gear for more than 50 years. The company’s guiding principle is to provide the highest quality, most reliable, and most affordable sports optics products on the market. Bushnell product lines enhance the enjoyment of every outdoor pursuit, including nature study, hunting, fishing, birding, and stargazing. The Bushnell Scout 1000 ARC laser Rangefinder makes sure you hit all your targets whether you are practice shooting or hunting. He is the real deal salesman. I got real merchandise..
Got the item quickly. It came exactly how described. Perfect! Super fast shipping! Thank you! Great product at a great price. Very happy! I Iike the range finder, but I wish the cross hairs and the letters would light up in a different color then black. A little hard to see in low light or with dark back drops. Everything else is great. Great size and super easy to use. Had this unit for app. 3 weeks. Good clarity, yardage seems accurate. Won't range through blind shoot through mesh, old Nikon would. During a recent hunt had some very lite fog would not give a yardage. On occasion in brush mode in the fog would get a reading but it was not accurate. Want to continue to use during other types of weather conditions before giving a complete review..
Great range finder for the money! This is my second rangefinder purchase. I love my original Bushnell Yardage Pro Compact 600 and have never had a problem with it but I've had it for 11 years and the ARC feature wasn't available at that time. I hunt primarily with a bow and the ARC feature is why I bought the Scout 1000. I feel that it will be a great addition for my hunting from a tree stand. Taking the guess work out of angled shots will be great for my confidence when the shot presents itself. 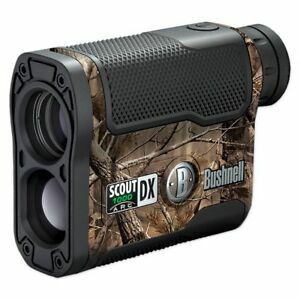 Bushnell makes a great rangefinder and the Scout 1000 appears to be well made and works as described. The only things that I would complain about is that I wear glasses and the lens is set too far away from my eye to get a full field of view with them on, so I either have to remove my glasses or be content with only seeing a small center view. However, I can see what I need to and can work around that. It is a little frustrating that the operating manual says to fold the eyepiece down for glasses wearers but it doesn't have a fold down eye piece on the unit, I'm not sure what they are talking about there. The ARC feature in this unit is only good for 60 degrees angle up or down where as the Legend 1200 and some other units on the market are good to 89 or even a full 90 degrees. I wasn't aware of that when I bought it otherwise I may have spent the extra dollars for the 1200. However, I don't foresee a need for any shots at angles steeper than 60 degrees but you never know for sure where the animal will present itself, the extra angle of the 1200 would be worth the difference in price if you expect shots nearly straight up or down. The lens of the Scout 1000 are coated with Raingard which will also be a nice addition in foul weather. All in all I feel that it is a great range finder for the money and recommend it to anyone who wants the ARC feature but doesn't want to spend a small fortune to get it. Great product, if I had to I would buy it again! 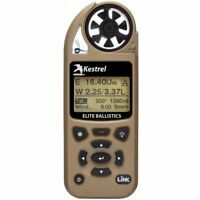 While I haven't actually used this on a hunt yet I have used it extensively setting up targets and practicing with it. It appears to be very easy to use, accurate and fast. The only thing I have noticed is that I have a hard time getting ranges at longer distances (400yards +)I love the ARC technology as I bow hunt and rifle hunt. The ballistics table showing bullet drop really saves me a lot of time, and the shoot for reading in bow hunting mode is fantastic. Now if they could just figure out how to make it do windage also! Over all I am very pleased with the Scout 1000 and consider it a good investment for the price. Works great for field archery. Ok for medium range precision rifle. 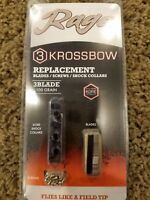 I bought this for 2 functions, 1st to use with recreational field archery and 2nd to range targets for medium range precision shooting. Inside 100 yard on "bow mode," the rangefinder works great and as advertised. Providing the angle and true horizontal distances is essential to help connect with your target and aids in the prevention of lost arrows ; ). When deploying this unit for longer distances, the rangefinder has a hard time getting a read/fix on non-reflective targets over 800ish yards. The 6x is decent magnification for checking your grouping (when using it archery) as far as 90 yards on a clear day. Be sure to adjust the eye piece to get the clearest picture. The glass resolution is overall a bit low but for the price range it's on par with other rangefinders. You can get a rangefinder with higher resolution glass but expect to pay 5 or 6 times what you will pay for this little tool. One unadvertised feature is that this rangefinder has a standard tripod threaded mounting point at the bottom of this unit. Time will tell how the battery life will be. The waterproofing looks like it will hold up to it's advertised claims.